Kalleda is RDF’s flagship school. Housed in the former estate of the Errabelli family, the school combines high academic standards with activities such as sports, cultural activities and a working farm. The school exemplifies RDF’s emphasis on preparing students for the modern workplace while respecting their cultural heritage. Students farm paddy and vegetables with organic fertilizers, and the resulting produce is used for their mid-day meal. On the same campus, a computer lab lets rural children learn the Internet and computer skills, vital for modern careers. The success of Kalleda School is seen in the district, state and national competitions where the students have won awards in a wide range of events which include athletics, yoga, kho kho and kabbadi. Students have also won District and State level INSPIRE fair – a Government initiative to build scientific temper. 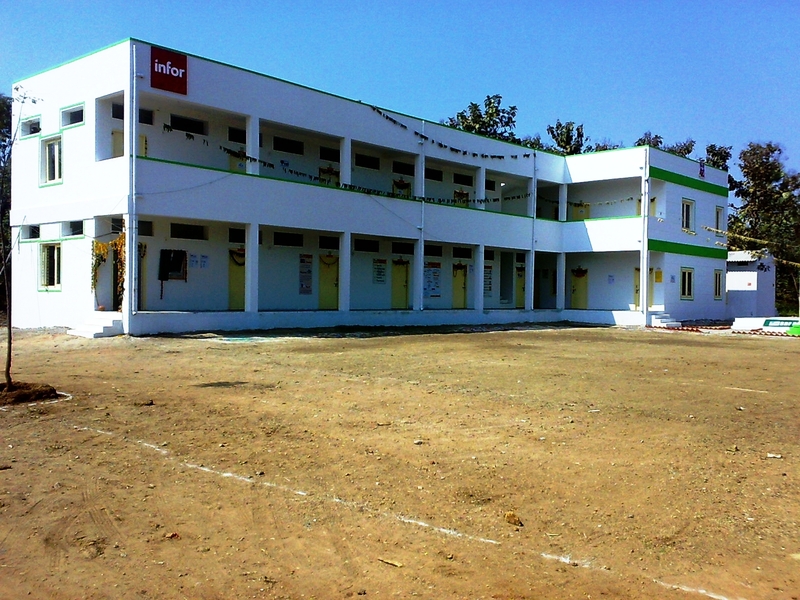 In the latest news, a new High School building was constructed for Kalleda school students in the Junior College premises. This building will house 20 rooms. Donations are being raised from various sources towards completion of the pending work and construction of the primary wing. Matendla was the first RDF school to be built outside the Warangal district. In a decade, it has grown from a small primary school “under the trees” to a building with modern infrastructure and facilities. In 2015, a new block with additional classrooms, science & computer labs and dining hall were added with funding from Kapil Education Trust. Another initiative of Kapil Education Trust has given direction to create a self sustainability plan in a period of three years. Kapil Education Trust solved a problem faced by students who found it difficult to reach school on time due to the absence of proper transport system by donating a school bus. They have also installed a water plant which has solved the drinking water crisis in the school as well as the entire village of Matendla. The school has many innovative and creative programs in order to enhance the skills of its teachers and provide support to its students. Ingenuous activities have been deployed under ‘Art Education’ in which students have learnt how to use recycled material cloth and paper. Even natural material like clay and waste material such as, plastic bottles were utilised to create beautiful works of art, which has been a wonderful learning experience for them. The Library, the ‘Coin Game’ and School Radio have provided a fun push to learning English. Map Pointing has also become a game, with students testing each other on a variety of topics. The school is also proud of its sporting achievements. Over a period of 19 years many students have been selected to participate in – Kabaddi, Kho Kho, Volley ball, Floor Ball, Martial arts, Yoga and Athletics – at various levels and won prizes. Redlawada School is very happy to share good news on the infrastructure front. Cognizant Foundation has generously donated a library, consisting of academic and nonacademic books to enrich students’ reading experience. The teachers are also using these books as reference material to enhance their teaching. Cognizant Foundation has also donated towards the construction of new rooms and also to improve the computer department. The school also received a grant from the Australian Consulate’s Direct Aid Program to construct toilets for staff and students. Moreover, RDF was able to secure funding from the founders and well- wishers to complete the new school block. Redlawada is proud of the fact that it reduced the cost of its midday meal by $6 USD a week. Students and staff are making good use of their organic garden, which supplies vegetables for their own meal, and to other RDF schools. Nothing is ever wasted. Ash from the fire wood is used to fertilize the soil! Rollakal School classes started under the trees in an open area. But the founder members of RDF went out of their way to purchase a piece of land to construct a new building. Further good news came in the form of a construction grant by the international IT services organisation, Infor, and its employees. The entire cost of construction, including site design, contractor and vendor relationships, site visits and painting of the entire school building was done by Infor employees. The school was inaugurated in January 2013! With this, another RDF dream has come true. In July 2013, the school received a grant from Invensys to start construction of a dining room. This is yet another milestone for the school as well as RDF in terms of growth. With the help of an extensive play ground, the children have taken up many sporting activities. Athletics and gymnastics have enhanced fitness levels of the students, as demonstrated via the photograph taken during a sports event. The Junior College is best known for its excellence in archery. This was accomplished after one of its former students shot to fame in the 2007 Asian Junior Championships and the 2008 Beijing Olympics. Over the years, the college has made great strides in academic excellence and sports accomplishments. Student’s perseverance has been paying dividends and they have been winning regular awards at both state and national events. The college has day and residential facilities and provides instruction in both Telugu and English mediums. It attracts students from the surrounding districts. The lecturers at the College are all fully qualified and experienced to teach productively. Courses offered by the Junior college include groups– MPC (Maths, Physics, and Chemistry), BPC (Biology, Physics, and Chemistry) and CEC (Civics, Economics, and Commerce). Another achievement of the college was sending 8 students to Kakatiya University to participate in the ‘Inspire’ program organised by the Union Department of Science and Technology. Students needed to have scored 9.2 GPA in the SSC Examinations to qualify for participation in this event. The students won 2nd place in a Quiz competition and received a shield and merit certificates.